We schedule all work one week in advance with the unit manager or with whom ever is designated contact point. All work is performed Sunday through Thursday unless requested differently by the customer. We are available for am or pm services; whichever our customer require. Our offices are staffed to meet any inquiries in regard to any aspect of our service to include billing, scheduling and operations in Atlanta, Georgia and Orlando, Florida. They are there to assist all customers in any aspect necessary to keep customer fully informed in regards to their account. Personnel are available 24 hours per day, 7 days a week to meet our customers needs. The crews reconfirms all work approximately two hours before scheduled time on the day of service. The crews arrive on time and are prepared to perform the services that are scheduled. An “Exhaust Cleaning Service Report” is filled out by the unit representative before the crew leaves the job with one copy left at the unit for the unit management or fire marshal review. A hood sticker is affixed to the hood which meets all NFPA 96 requirements. This will include the hoods, plenums, all accessible ducts and fans. 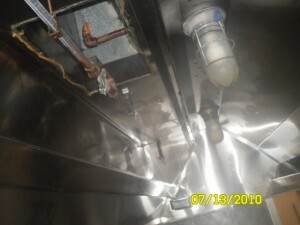 In Florida we also provide the Fire Suppression System inspections and installation. This includes extinguisher inspection, sales and installation. We can install hinge kits to the fans as required by NFPA 96. 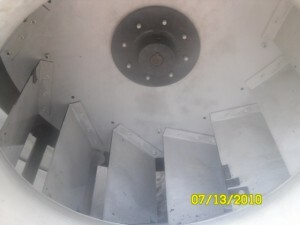 We can cut and install access panels into the duct work to allow for a more thorough cleaning if necessary. Grease filters in a variety of sizes and materials are available for purchase when needed. We can also direct our customers to a variety of companies that offer a wide array of roof protection devices.